Visitors at the inter airport Europe expo in Munich, Germany. More than 600 exhibitors will present their latest developments and solutions for airports of the future at inter airport Europe, the world’s leading airport exhibition which will be celebrating its 20th anniversary show this year. The event is scheduled to be held from October 6 to 9 at the Munich Trade Fair Centre in Munich, Germany. 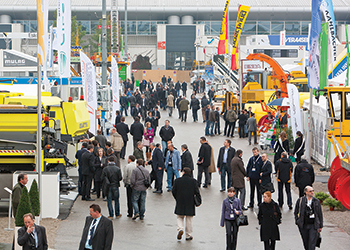 “The international exhibition for airport equipment, technology, design and services is well-known as the one-stop shop event for the entire airport industry,” says a spokesman for Mack Brooks Exhibitions, the show organiser. The exhibition profile comprises all areas of ground handling, terminal operations, airport IT and airport design. The target audience mainly consists of international industry experts from airports, airlines, air cargo carriers and aviation-support, including those from the Arabian Gulf region where mega developments are taking place, says the organiser. The previous exhibition attracted a total of 11,900 visitors from 110 countries. “Airport upgrades, extensions and new builds are currently being planned, especially in the Middle East. In order to develop and build modern airports, it is necessary to source the latest technologies and equipment. These will be presented all in one place, at inter airport Europe 2015, the one-stop shop event for the airport industry. Airport operators will be able to source the latest equipment and systems for terminal construction and furnishing as well as for the construction and servicing of the runway. Hundreds of exhibitors present their products for all areas of the airport – terminal, design, data and ramp,” says the spokesman. The key areas for new developments are passenger handling, security, cargo operations and GSE. Airport operators are, therefore, investing in fully automated handling systems, live interaction with the passenger via their smartphones, enhanced data exchange, time-efficient aircraft handling, security, cargo operations and GSE to enhance cost-efficiency and sustainability. The latest technologies and advancements in these areas will be presented at inter airport Europe, where visitors will be able to get an overview of the latest innovations which are available and meet new suppliers and potential business partners, the spokesman adds. A visitor brochure in English and German has recently been published which can be ordered via the inter airport Europe website. The brochure includes an exhibitor list, a detailed exhibition profile, opening hours, ticket prices and details on how to get to the show. A show preview will once again be published in August, giving visitors the opportunity to gain an overview of the variety of products and services on display in Munich this year. Hundreds of exhibitors are included with profiles on their new products they will be presenting at the show. The show preview will be available as a printed and online version. inter airport Europe takes place at the Munich Trade Fair in halls B4, B5, B6 and the generous outdoor area for the display of large-scale exhibits. The show grounds are located east of Munich and within easy reach of the city centre, either by car or by public transport. The airport is also well connected to the exhibition grounds, with regular shuttle buses running on all exhibition days. Tickets will be available via the Online Ticket Shop from September 2015 or can be purchased on-site during all four show days. “Visitors from outside of the EU should make sure to reserve plenty of time for obtaining a visa. inter airport Europe’s service provider Intercultural Consulting will support trade visitors with their visa application by issuing an official invitation letter to the show,” says the spokesman, adding that further information is available on the website in the Travel & Hotels section.